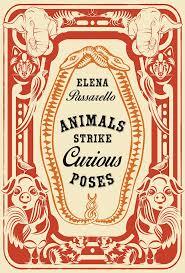 Animals Strike Curious Poses, Elena Passarello’s collection of essays about animals, is…well, different. She mixes fact and fiction to create what might be dubbed entertainment science. The anthology begins with “Yuca,” who was a 39,000 year-old mammoth. Throughout the book, readers are continually reminded of the magical nature of animals and the pleasure and wonder they give us. For example, wooly mammoths inspired some of the earliest artwork known to man—cave drawings. The author also examines the dark side to man’s relationship to animals; the cruelty inflicted on them, the advantages taken, and the presumptions that animals are there for us, often without any regard for their health, safety, or survival. In all, the anthology contains seventeen short essays; the final one is about Cecil the lion who, in 2015, was killed by a hunter in Zimbabwe. We also learn about a wolf, a bear, a pigeon(s), a spider that goes on a space mission, Jumbo the elephant, Koko the gorilla, etc. Koko was a gorilla who learned sign language. In the brief, two page “Koko” essay, Passarello creates a fanciful conversation between a person and Koko, who only uses the words and phrases she can sign. This anthology is difficult to read and not one I’d be inclined to read, except it was a book club assignment. To me, the most challenging piece was “Joeffry.” It’s a partial retelling of Christopher Smart’s 1760 poem, “Jubilate Agno” that praises the cat, Joeffry. In Smart’s poem, he manipulates language and uses snippets of fact and fiction about literary and historical happenings and characters. It’s unclear to me how much Passarello has reworked Smart’s stanzas, or if she’s playing it straight and has just reprinted parts of this extravagant, lush-language poem. Perhaps the most well-known story is “Vogel Staar,” about Mozart’s pet starling. It explores the idea of Mozart and his songbird having musically collaborated on some of the young composers works; and it is worth the read. Coincidentally, a few months after reading the essay, I heard Elena Passarello interviewed on NPR. The interviewer focused on her “Vogel Staar” essay and the producers accommodatingly played both Mozart and starling tweets and twitters. Maybe it was my lack of a musical ear, but I wasn’t totally convinced that Mozart was influenced by his bird, however the concept was unique and imaginative; as is much of Passarello’s book.